The first SSD with QLC NAND memory has been spotted at webshops and the price is rather interesting. At the moment the 512GB model is available for 114 Euro, which means 20 cents per GB. The Intel 660p NVMe comes with M.2 form factor and PCIe 3.0 x4 interface. The 660p NVMe should be part of the new series of SSDs from Intel. The lineup should include the 760p, 700p and 660p branding. 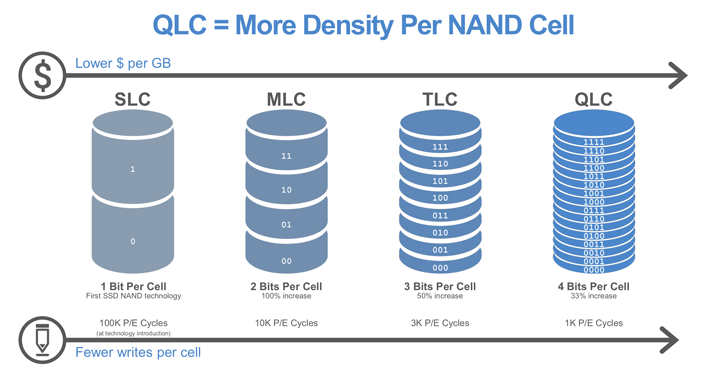 While two of them come with TLC memory, the third one sports 4-bit per cell (QLC) flash. The upcoming Intel 660p NVMe will be available with 512GB, 1024GB and 2048GB capacity with prices set to 114, 198 and 391 Euro respectively. Performance wise, sequentially reading these drives should achieve up to 1'800MB/s and 1'100MB/s in the case of sequential writes. The random performance comes to 150'000 IOPS in both read write. Since the Flash Memory Summit 2018 is rather close, we expect lots of QLC related announcements.